I heard Jessica Lange being interviewed by Charlie Rose a few years ago and was amazed during their discussion when Jessica said, “I consider myself a sad person.” She said this with a smile on her face and added that she also felt much happiness and joy in her life, but that a big part of her basic nature included feeling sad a lot of the time and that she accepted this truth about herself. Wow. For some reason that has always stayed with me and I think about it all the time. I remember being struck by the unabashed freedom in this point of view. You mean, we don’t have to be happy every minute of the day? It's not a school assignment that we'll get in trouble for if we don't do it really well? Sadly, being happy to me often feels like an obligation, and I go through so much guilt when I’m coming from other places which is a lot of the time. And then, if I even let it slip to the world that I’m not feeling deliriously happy at that second (not that I’m ever really fooling anybody when I’m not), I have to quickly add all the asterisks about how I really AM happy but I’m just in a weird space and I’m so sorry so just give me a moment and I’ll try to get back to happy…wait, it’s not working, what’s wrong with me…no, I promise I’ll be happy in a minute, hold on…yes, I realize how lucky I am and how much I have to be thankful for and that’s why I know I really am happy, damn it, so just give me a second here. **Cue guilt/shame spiral. ** I’m now learning that I can have a happy, fulfilling life and still acknowledge my feelings of pain and sadness without feeling ashamed or spoiled or self-indulgent. If anything, it’s only by allowing my feelings of sadness to see the light of day that enables them to run their natural course and dissipate. When I force them underground with all my guilt that I’m doing something wrong, they get stuck there and hang on for dear life since they’re so afraid of being attacked again. And then at those times when I'm feeling so emotionally constipated I think of what Jessica Lange said in that interview and it’s like a mantra to me. And I know that I can only be happy if I stop trying to be happy or thinking I must be happy. Thanks for your comments today--they brought a smile to my face, even though I would definitely not call myself happy today- it brought me a moment of mirth. I checked out the site blogsnow.com which is supposed to rate the top blogs. I looked at most of the top 20 and I didn't think any of them were as entertaining as yours. Danny, we are always reading, just not always commenting. This one struck a chord with me too, because I feel like once I learned to accept my own sadness, there was a great emotional liberation within. Now if I could only do the same with anger I would be all set. I agree, and I also wonder if all anger really comes from sadness if you peel it back enough. Or at least from hurt and fear. I'm still getting my emotions confused since they all terrify me. I am experiencing both anger and sadness that you have not posted today. Hi. I have never read anything on your site except the "Jessica Lange--sad" post, which I stumbled upon quite by accident. But, I wanted to tell you that it made me feel SO much better about myself. And I've sent the link to other people I thought it might help as well. Just thought you should know. 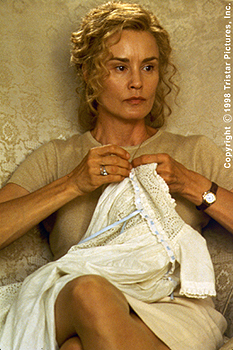 Dear Sir, Seeing Jessica Lange in Postman Always Rings Twice I felt that was the best movie she has ever acted in and to do that scean in the Kitchean when he made love to her after picking her up from the corner excited me and ever time I watch that scean gets me excited. Yours, Faithfully, Mr Anand M Pillai. Its just me a David Guerrero alias Mr. G. saying hello rrrrrrrrrrrrrrrrrrrrrrrrrr, do you shag ? just kidding how are you ? as for me getting repaired as usuall Take care Mr. G. Out, Do you wish me to save you from Kong :? That is a very healthy attitude! Too bad everyone else can't adopt it. No one can possibly be happy all the time. It defies nature itself. Everything is cyclical. In answer to your ponderings, Danny, I believe that there are two Supreme emotions from which all other emotions generate: Love and Fear. Anger and sadness both come from Fear, and if you analyze your feelings thoroughly enough, you will find what it is you are so afraid of that is creating your anger/sadness. And conquering your Fear is the quickest way to ultimate happiness, which is Love. ...Does that make me sound like a hippie?? This struck a chord with me as well. I remembered my response of shock when a friend blurted out "You don't HAVE to be happy all the time!" when I was so down after some really bad things happened all at once. I'm glad that others know the self-talk that goes on to "put on a happy face". Who the heck trained us that way - and WHY?! Kudos to the gorgeous Jessica for being so upfront about her core of sadness. I think you would like Pascal Bruckner. I got a lot out of this short essay. Really thank you for posting. Awesome post...I can identify with you A LOT....thanks.